Roberto de la Riva, an organizer with Inquilinxs Unidxs por Justicia, addresses a crowd gathered in the rotunda of Minneapolis City Hall to bring the struggles of renters from across the Twin Cities to the attention of the Minneapolis City Council during the Renter's Day of Action. Photo by Cristeta Boarini. It seems that each day Minnesotans hear about another community whose homes are being taken from them: the residents of Glendale Townhomes in Minneapolis, Lowry Grove in St. Anthony Village, and Crossroads at Richfield for starters. And along the Green Line recently, apartment renters and their allies heard even more stories from passers-by who shared their own stories of housing injustice. On Sept. 22, renters from across the Twin Cities rallied in Minneapolis and St. Paul in an effort to draw attention to the injustices and challenges they face.They also held a press conference at the St. Paul City Hall, which had declared the day to be a National Renter’s Day of Action, and met with Minneapolis City Council members. One of the key issues brought up by residents, outside of safety concerns, was the increasing cost of affordable housing. Just days after the day of action, a report, released by the Minnesota Housing Partnership, noted that low-income renters in the Twin Cities are being priced out of affordable housing as the cost of rent increases. By coming together for this one day, this Renters’ Day of Action, they are able to organize toward change in ways that the groups couldn’t have done alone. Twin Cities residents are losing their homes as more and more housing is sold to developers looking to upscale their housing complexes, according to the MHP report. The developer boom has led to a decrease in affordable housing units, increasing the costs of affordable housing, and – as MHP Executive Director Chip Halbach pointed out – may lead to an increase in family homelessness unless immediate action is taken. “It is a situation that has worsened to the extent that stronger reactions and actions are needed. [Without those reactions and actions] it looks like there will be continued investment and loss of more of these properties. The landlord of last resort will say ‘hey, you can cram as many people into this home as possible, and I’ll make money, and I won’t do much, because you don’t have alternatives.’ We do think there will be more homelessness out there, even though family homelessness has declined recently, it’s just that the situation is such that it looks like it will increase,” said Halbach. Issues of affordability, as well as concerns about safety and the lack of preservation of affordable housing in the Twin Cities, brought together residents and their allies for a rally down the Green Line LRT. “The day of action was beautiful. 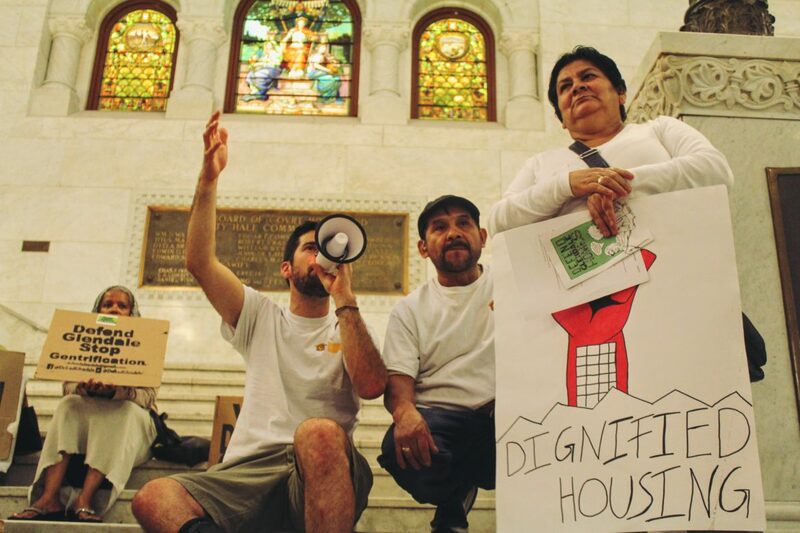 We had a various myriad of tenants come out and kinda share and understand their differences in our cities, but we also saw a commonality in terms of displacement,” said Roberto de la Riva, an organizer with Inquilinxs Unidxs por Justicia. “If you stay silent, they will step on you. If we fight, we win,” said Luis Caguana, who rents an apartment in Minneapolis and is a tenant leader with Inquilinxs Unidxs por Justicia. The renters’ rights tour was the work of a partnership between several organization including Inquilinxs Unidxs por Justicia (Tenants United for Justice), Frogtown Neighborhood Association, Defend Glendale, the Community Stabilization Project, and others. It was part of a national day of action organized by Right to the City, a national movement which fights against gentrification and displacement and for justice, democracy, and sustainability in cities. The day of action was necessary, because of the commonality of oppression that all the tenants who participated face, said Arike Ogundip, a two-year resident of Minneapolis originally from California. 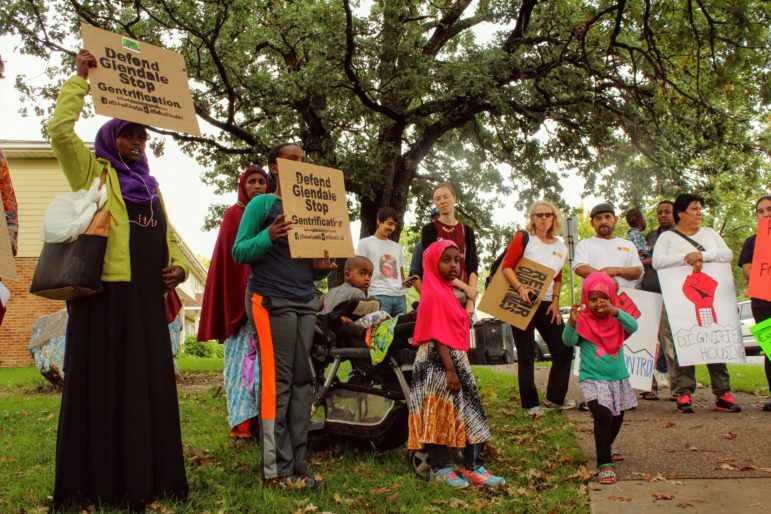 Residents and housing organizers from across the Twin Cities gathered at Glendale Townhomes on Sept. 22 as part of a day-long tour from Minneapolis to St. Paul during the Renters’ Day of Action. Photo by Cristeta Boarini. “The day of action was powerful because the commonality was oppression, was injustice, the commonality is having the system betray you constantly, that’s the commonality. There comes a breaking point that instead of bending down and taking this oppression, you stand up and then when you stand up, you look around, and you see that’s it’s not just you and not just people from your own background, you look up and see its people of all backgrounds. The commonality is that very thing of oppression. And alll we’re saying is it’s not like this for everybody,” said Ogundip. As part of the event, renters talked about gentrification in Frogtown, visited the unique community of Glendale Townhomes to hear about the battle with Minneapolis Public Housing Association, and even traveled to the home of Steven Frenz, a Minneapolis landlord. With all the groups working together, they not only learned about each others’ struggles, but could support each other. “At the vigil when we drove to Steve Frenz’s $3 million home, it was one of the most powerful things to me, getting to stand up to my oppressor, telling him about my experience of being his renter. It was so powerful. I was shaking, but I kept speaking because I had people behind me, supporting what I was saying,” says Ogundip, a board member for Inquilinxs Unidxs por Justicia. With members from Defend Glendale and other nonprofits there to confront Frenz, Ogundip noted that that feeling of collective power is core to the coalition being built amongst tenants and their allies. “Even though I was scared to speak up, maybe someone else was too scared to say anything, so I was maybe able to speak on their behalf, hopefully. It’s a very powerful thing,” said Ogundip. The coalition plans to continue its work as they focus on organizing around local policy initiatives, including rent control and a tenant’s union in the Twin Cities, said de la Riva. De la Riva also noted that his organization has plans to expand their organizing beyond Minneapolis in to St. Paul and the suburbs. The demands of the national renter’s day of action include a national rent freeze, an end to unjust evictions, community control over land and housing in our communities, and tenant’s right to organize against their landlords without fear of retaliation. “I am really excited for what that coalition can mean for potential big policy battles in the future, but also for connecting renters and people who are directly affected by the issues. We are going to share with each other, learn from each other, ” said de la Riva. Minneapolis needs to stop putting up barriers to new construction. Some single family homes will need to be torn down to make room for high rises before housing can become affordable. 12 years ago, the Legislature set out to end poverty in Minnesota by 2020. How’s it going? Dr. Joi Lewis’s debut book offers path to healing and liberation Dr. Joi Lewis, originally from East Saint Louis, Illinois, says that many in Black and brown communities are suffering from intergenerational oppression and trauma. “That’s why healing ourselves is so radical,” said Lewis, life coach, self-care expert and author of Healing, The Act of Radical Self-Care.